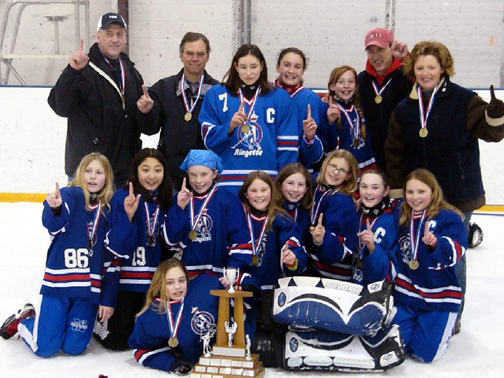 With deep sadness, Ringette Canada and the entire ringette community mourned the loss of our sport's international ambassador, Agnes Jacks C.M. Mrs. Jacks passed away at the North Bay General Hospital Scollard Site on Friday (April 1). She was 81. Member of the Order of Canada, Agnes Jacks was the widow of Sam Jacks, who invented the sport of ringette in 1963 in North Bay, Ontario. After Mr. Jacks' passing in 1975, Mrs. Jacks worked passionately to promote the sport both within Canada and around the world. 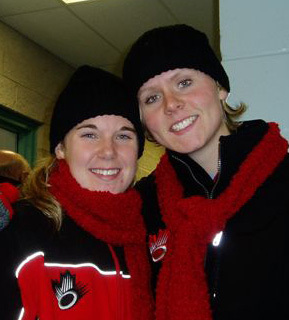 Two Calgarians - Jodi Jensen and Stacey McNichol were on Team Canada at the 2004 World Ringette Championships in Stockholm, Sweden. Finland regained the world title after defeating Canada 9-3. Canada returned home with silver and USA with bronze. 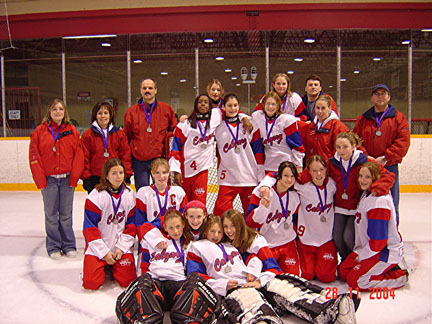 At the 2002 World ringette championship in Edmonton, Alberta, Canada beat Finland 3-1 for the gold and USA beat Sweden 10-3 for the bronze. 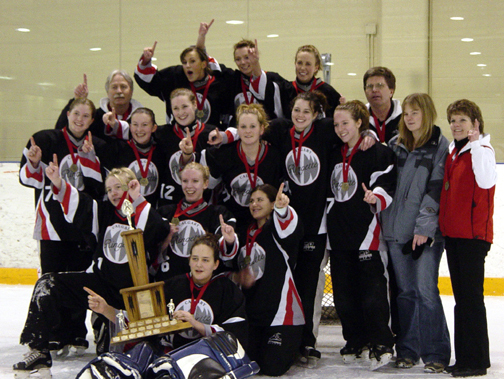 The next World ringette championship will be held in 2007. 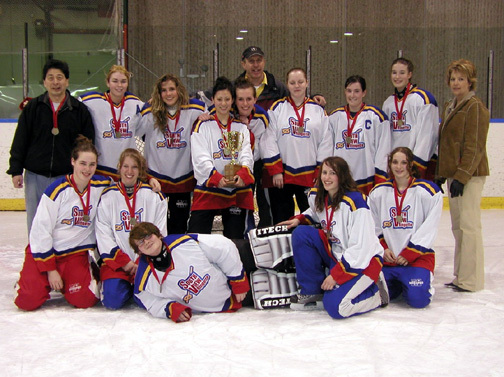 2004-05 was the first season for The National Ringette League (NRL) which is the showcase league for Ringette in Canada. The league had 17 teams in three divisions - a Western Division (8 teams), an Ontario Division (4 teams) and a Quebec Division (5 teams). 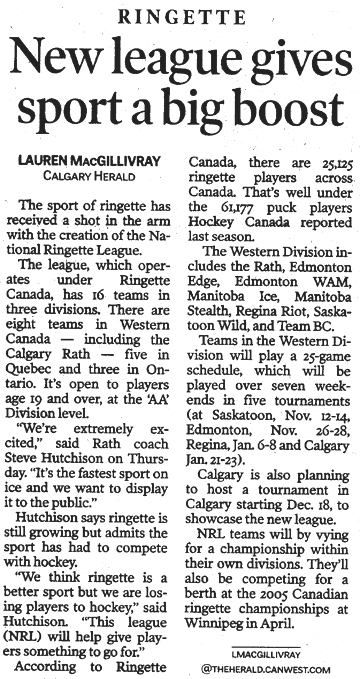 Calgary iced its first NRL team - Calgary RATH. 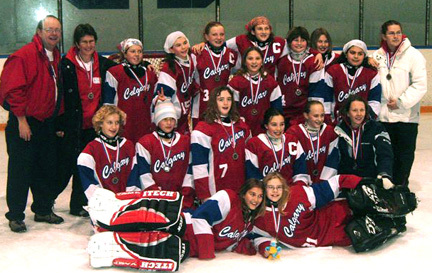 Calgary came home from the north with medals in every division. 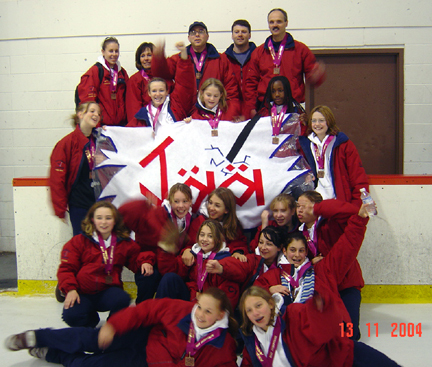 Tween AA Jaa attended the Western Canadian Ringette Championships in Regina where they won GOLD. Junior AA Tuulii and Belle AA Altius attended the Canadian Ringette Championships in Winnipeg where the Juniors won Silver and the Belles won GOLD. Tween AA Team Alberta are off to Westerns in Regina. 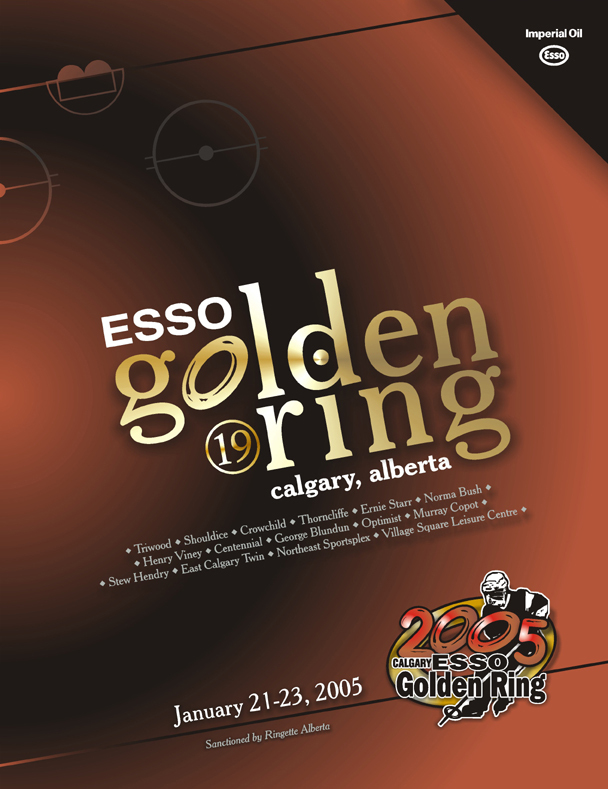 The 19th annual Esso Golden Ring was held Jan. 21-23, 2005 and hosted Bunny through Intermediate divisions. The Tween AA, Tween A, Junior AA, Junior A, Junior B, Belle AA, Belle A, Belle B, Deb A, Intermediate A and Open AA divisions used shot clocks for all games. Customized Game sheets with the Esso Golden Ring logo on them were used once again. Calgary Teams Tween AA Jää and Calgary North Zenith Junior A won the right to represent Alberta at the Western Canadian Championships in Regina. Kristy Oram – MVP of the final game. Carolina Romeo and Renee Tawtel were selected for the 2005 All-Star Team. 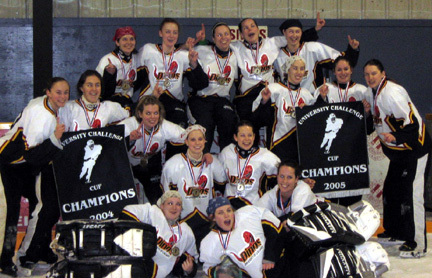 The University of Calgary Ringette Club successfully defended its 2004 title by winning the 2005 University Challenge Cup in Landmark, Manitoba on Jan. 4, 2005. 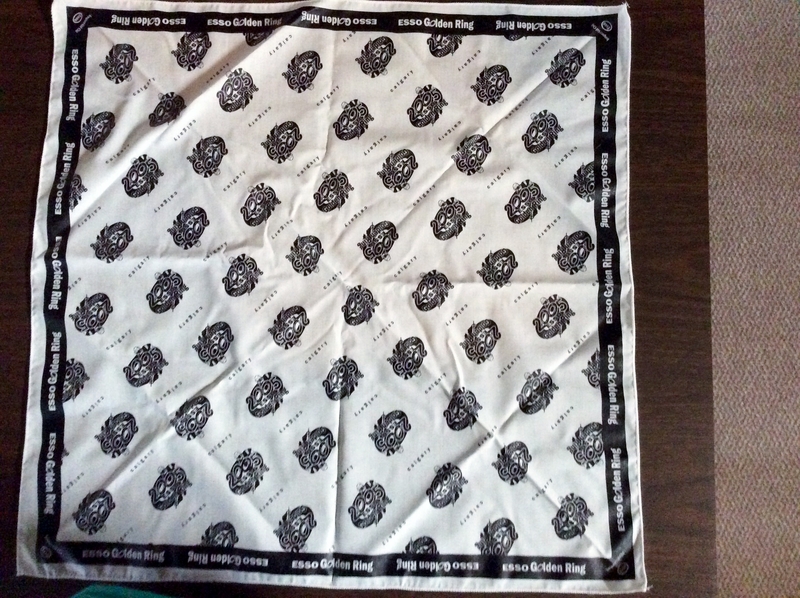 The U.C.C. 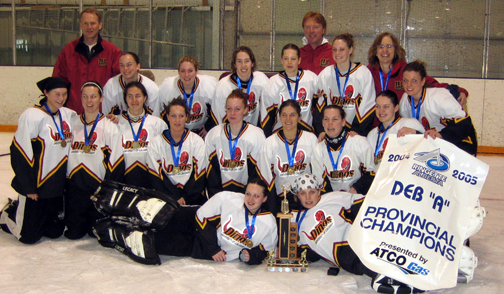 is growing in leaps and bounds with two new University teams, Laurentian and Ottawa joining Manitoba, St. Boniface, Calgary and Alberta in the 2005 tournament. With Dinosaurs, Bisons, Pandas and Gee Gees roaming the corridors it truly gave a "national' feel to the event. Competition was intense and Calgary was victorious because it excelled in all facets of the game.The final against our friends from Edmonton was a fine exhibition of Ringette, with Calgary triumphing with a 3-1 victory. Several other universities have verbally committed to sending teams in 2006. 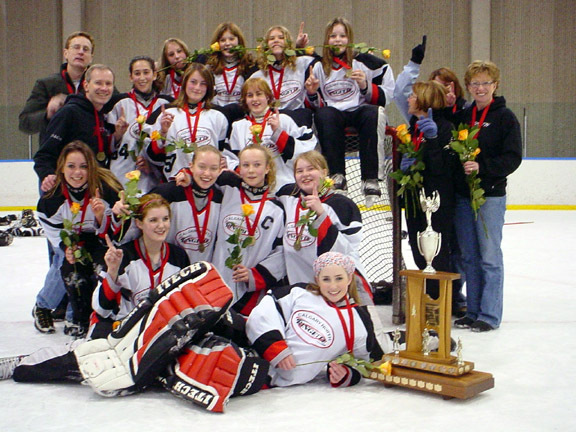 April 16, 2005 – The National Ringette League (NRL) presented its first annual awards during the closing ceremonies of the 2005 Canadian ringette championships in Winnipeg, Manitoba. 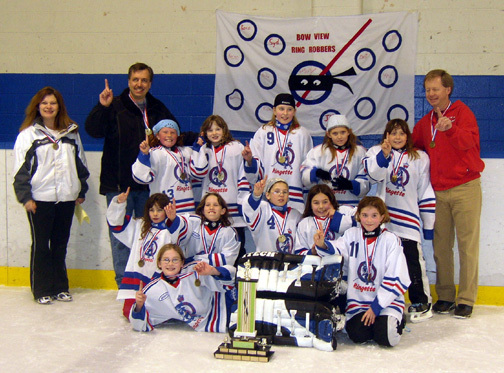 “Our first National Ringette League award winners have set a high standard of achievement for those who will follow in subsequent years," said Jim Dawson, president, NRL Board. Trophies were presented to Maria Thompson of the Edmonton Edge for Most Valuable Player, Jennifer Gaudet of the Cambridge Turbos for Best Forward/Centre, Alexis Snowdon of the Edmonton WAM! for Best Defenseman, Claudia Jette of the Montreal Mission for Best Goaltender, Katie Lugg of the Gloucester Devils for Rookie of the Year, and Steve Hutchison of the Calgary Rath for Coach of the Year. Ringette Calgary offers sincere congratulations to Steve who is a valued and respected member of our ringette community. 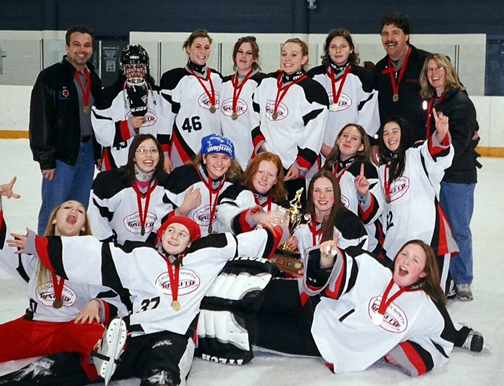 Bow View Petite A Dynamyte participated in their first ever Provincial Championship & won Silver. Photos from Medicine Hat Tournament where South Calgary Petite A Ring Warriors got Bronze. 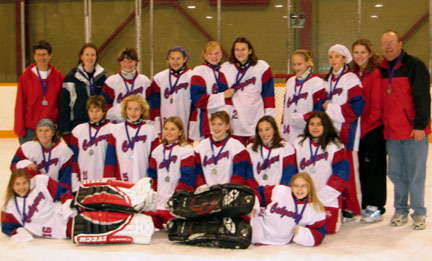 NW Tween B GPanthers who won Gold at the Lethbridge Ringette Tournament in November. Tween AA OMADA won gold and had lots of fun at the Ajax Silver Ring tournament. 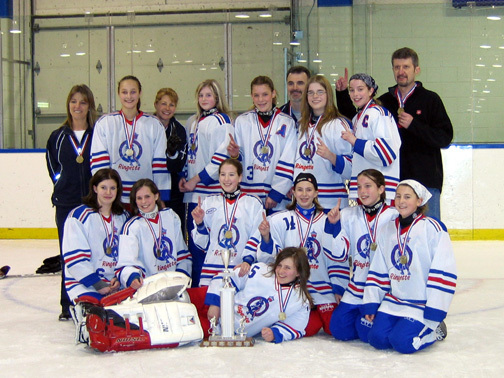 Calgary Belle AA Altius were undefeated in their age category all year (one tie in one tournament) including Provincials.